The New York Times article on the murder of Annie Mae, an article of the likes not often found in a major national publication, but one whose time has come. Regrettably comments are now closed, much the same as “ongoing investigations” into the murders AIM committed. Closed, when the opposite should be true – when every aspect, every approach should be investigated, taken, and emblazoned across the public conciousness. AIM survived as did individuals in it’s so called leadership like Dennis Banks and Russell Means primarily due to the support of a fawning national media and viewer readership with film clip imagery of cowboys and ndns dancing in their heads. 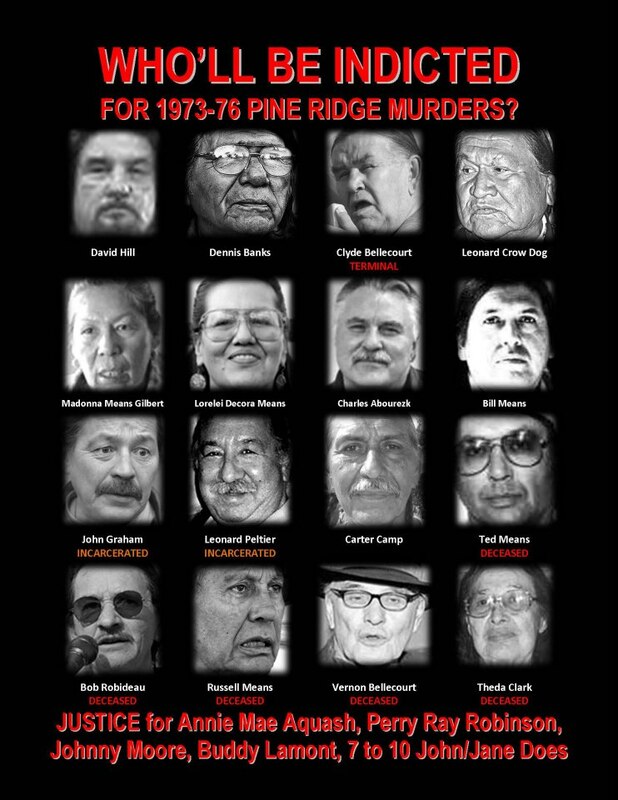 The onus now more than ever is for the media and this misguided support base to admit the truth and atone for the rez situation they helped to create – an environment where territory has been divided up among the leadership, thugs such as Leonard Peltier are promoted as being representative of the people, alcohol and substance abuse have skyrocketed, ceremonies are routinely rebranded as being Dennis Banks, Crow Dogs, or even AIMs and sold to further enrich this cadre of frauds. Does atonement sound too harsh, too demanding? Then call it an act of goodwill or conscience if you prefer. Either way though it is an essential ingredient that will ferret out the vermin and leave the nations with one less burden to bear. And what form should this atonement/goodwill/act of conscience take? The simplest and least expensive of all, if you cannot accept the reality and speak the truth then don’t continue promoting the lies. If your ego is such you cannot admit to having been duped, cannot ask the hard questions or entertain the doubts they create then at least shut the hell up….neither the AIM leadership nor Peltier are the underdogs, the rest of us are. yes, SOOOOOO many with inflated ego’s , DUPED !!!!! Mind if I run some copies off and post them wherever shAIMless GGC crap is posted? I’ve noticed an upswing in blAIM related junk on the bulletin boards around here. Truth must be told and the blind followers that think AIM created earth need a wake up call. Not at all Wade, feel free any time. the earth, with the truth being anathema to that. I will be posting this too…if that is OK. Too many out there only know of what is flooding the gates right now. Facebook,etc. Bull and was Banks security slash gofer suspicions of some measure of knowledge or complicity aren’t unfounded. was undoubtedly seen as a possible threat. was in the U.S. and in contact with people….kind of tells a story doesn’t it? a story as well doesn’t it? Yes the story that says these ones can only speak the lie. In a nutshell that’s pretty much it. has been manipulated to portray the arrest warrant for Jimmy Eagle as being singularly about a pair of “old boots” ignoring the fact that it involved assault with a deadly weapon upon the owner and his companion along with kidnapping and physical beatings. I’m sure you’re aware of this as well but for whatever reasons choose to ignore it. You must also choose to ignore Peltier’s interrogation of Annie at gunpoint, also that of Minnie Two Shoes. Have you forgotten or chosen to ignore that Robideau had enough of the “myth” and left LPDOC? Or that attorneys seem to follow the same pattern? he is but won’t reveal his identity? The same Mr. X Peltier attorney Kuzma outed as being non existent. A real classic is where he denies ever even so much as going down to view the slain agents and then when advised his cousin Robideau placed him there he halting stumbles around admitting it. Take a look in the following blog, Leonard Peltier’s Own Words, and see if you’re willing to ignore them as well. For years it was Peltier was an “innocent man”, now as more has come to light and it’s become a hard sell it’s all about judicial misconduct. Kind of says something doesn’t it? If the truth is important to you and you would like for everything to be revealed, then join me in calling for Peltier to sign off on his parole board hearing and disciplinary records so they can become a part of the public record….after all, if you’re going to support him don’t you have a right to know? Doesn’t everyone? Haven’t you ever wondered why he won’t, what he’s hiding? I’ve said throughout this blog I want anyone with any measure of complicity for the events at Jumping Bull held to account. I want everyone with any measure of complicity in the murder of Annie Mae Pictou Aquash held to account. I want everyone with any measure of complicity in the murder of Perry Ray Robinson and others by the hand of AIM at WK2 held account, and I don’t give a damn who it is…fed, Dennis Banks, Peltier, Crow Dog, AIM, or anyone else. How about you – is your desire for justice such that you feel the same? And a final question – do you think it too much to ask that LPDOC/ILPDC open their books since they’re always begging for money? Peltier signed an affidavit so it must be true? That’s like saying Pinocchio never told a lie. The below excerpt is so predictable it isn’t even funny- a subtle hint that Konisberg is yet another “operative”, the Times an agent provocateur maybe? Did you know that Mathiessen had CIA ties at least during one point in his life – or that Russell Means sought the CIA’s backing related to his South American ventures? Those are facts – not speculation, not misdirection and begs the question in Means case what was this mighty “warrior” doing attempting to hang around the CIA fort? and when ILPDC quits trying to associate Peltier with Annie Mae. “During that same meeting at USP Coleman last January, we discussed and speculated what the response might be by the FBI, federal government and anti- Peltier forces, to both the historic visit by Professor Anaya, and the ongoing campaign for Executive Clemency from President Obama.